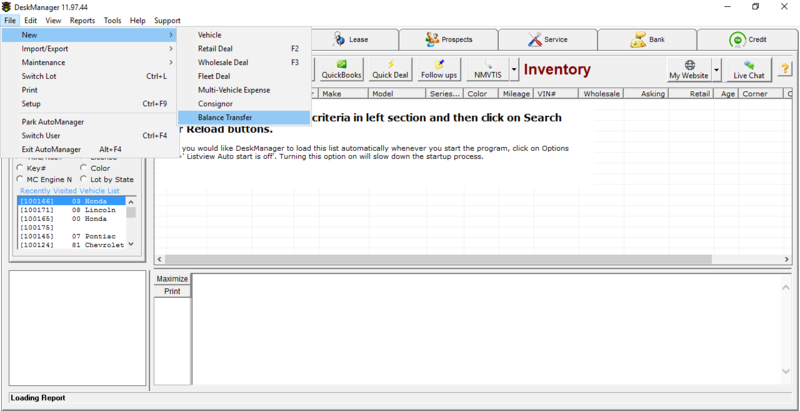 The Balance Transfer Tool in DeskManager is for adding a Buy Here Pay Here deal and/or vehicle, along with the current account balance, to DeskManager from a different source (such as a different DMS). Gather the deal information from the other source (not DeskManager). Enter Vehicle Information and Customer information. Only the stock number, first, and last names are required in these sections. The other fields may be entered later. Account Balance will show the balance of the vehicle, calculated from the previous fields. Check the balance against the account balance from the other source to confirm they match. Click Save at the bottom right, and a pop-up will confirm that the vehicle was added, the BHPH deal was created, and the balance transferred. To see the deal, click on the BHPH tab, then search by any of the allowed keys such as Stock Number, Last Name, Etc. 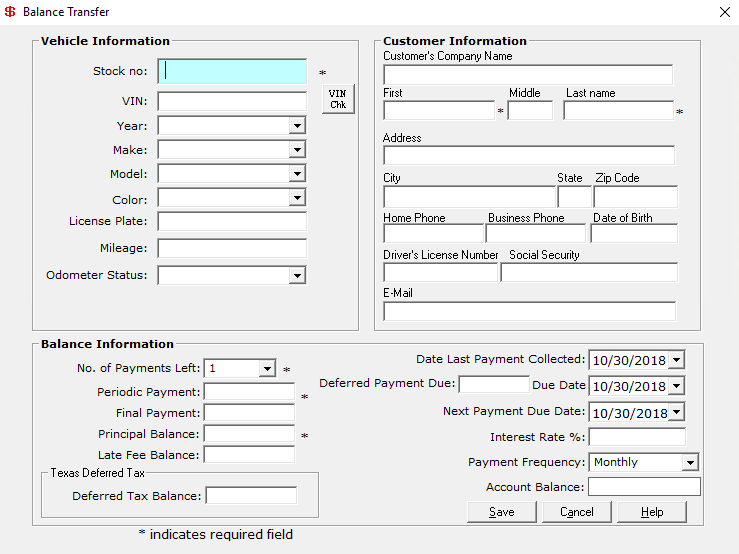 The Sale Date in DeskManager will be the date recorded in the Date Last Payment Collected field of the Balance Transfer tool. Double click the deal to open. Here you may add or correct any additional vehicle, customer or co-buyer details as needed. Click on the down-arrow of the Edit menu and select the area that you wish to update. You can also verify account, payoff and interest due balances compared to your previous DMS from the deal’s Payments tab.